Andrew Davidson is an Australian theatre director, musician, and lecturer based in London. His work ranges from plays to concerts, operas, and musicals. Davidson studied composition with Peter Sculthorpe and Kirsty Beilharz at the University of Sydney, and with Paul Brust and Osvaldo Golijov at Longy School of Music in the USA. He undertook further studies at Juilliard in NYC. He is a directing graduate of the National Institute of Dramatic Art (NIDA) in Sydney, and holds a theatre degree from the University of New South Wales. As a theatre musician, Davidson has created soundtracks for productions ranging from physical theatre to Shakespeare. He has written chamber musicals, cabaret songs, and music for ballet and contemporary dance. Davidson's concert works include songs cycles, a string quartet, a wind quintet, short works for chamber orchestra, and instrumental solos. 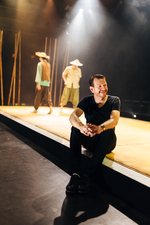 He has held positions as an Associate Lecturer at drama schools, music conservatoires, and dance institutions in London, Singapore, and Sydney.